The actors with disabilities are mostly members of the Thanal Paraplegia Patients Welfare Society. 'Chaaya' in Malayalam can mean tea or else semblance, depending on which ‘cha’ you use (there are two). VT Ratheesh, an artiste who has been active in village theatre for 15 years, named his new play Chaaya – meaning semblance, a one-word title like all his plays before. On a stage in Ernakulam are the nine actors of his play, all of them on wheelchairs. 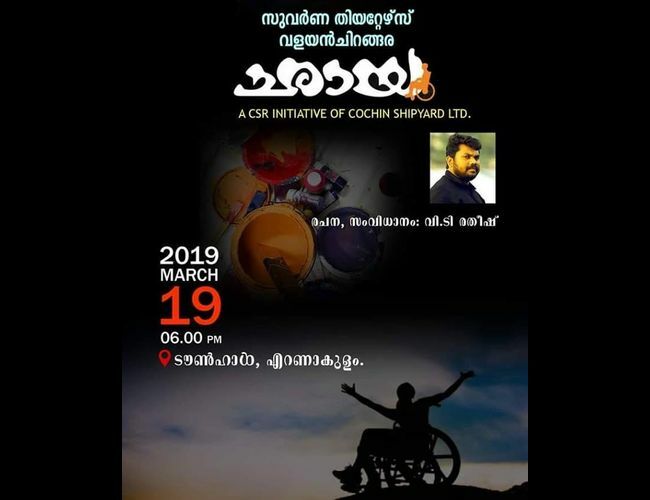 “They are paraplegic, and I believe it's the first time a play entirely made of people with disabilities would be staged in the country,” says VT Ratheesh, standing at the Ernakulam Town Hall where the play will have its first show on Tuesday evening. Ratheesh met them when they came as members of a ganamela troupe called Thanal Freedom on Walls to his village near Perumbavoor. Rajesh of Suvarna Theatres asked the members of the troupe if they would like to act in a play. Ratheesh was only happy to write a script for them – no different from what he would write for people without disabilities. “I didn’t write it any different from how I normally do. Only difference is that in place of people moving with legs, you would see them move on wheelchairs. In fact, it was easier to direct this play because they were all so enthusiastic about it,” says Ratheesh. The play is about a few migrants who have moved into the city, settled there and are starting a business of their own. When they want to hang portraits of their forefathers at their business place, they decide not to place the original images there. They are ashamed of the ancestors who were farmers. So, they ask an artist to make new portraits of people resembling them. “It is a family drama with a lot of sentiments. But it is also rich in humour,” says Ratheesh. Sarath thanks Dr Mathews Numbeli, district programme manager, National Health Mission, for helping them with vocational training. “After the training, several groups got formed. One of these is the ganamela troupe,” says Sarath. After singing in 169 stages from Kasargode to Thiruvananthapuram, they wanted to get into some other creative initiative, and that’s when Rajesh of Suvarna Theatres approached them for a play. The nine actors in the play are Martin Nettoor, Sarath Padipura, Unni Max, Saji Wagamon, Anju Rani, Dhanya Gopinath, Sunil Moovattupuzha, Jomit Madakkathanam and Biju V Thankappan.